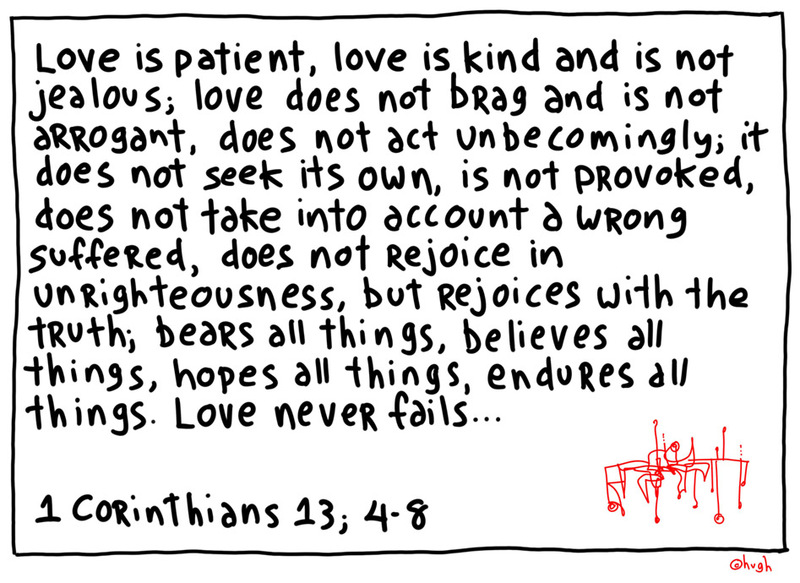 I first heard 1 Corinthians 13 read out in church when I was about nine or ten. Like a lot of things in the Bible, as a kid I found it puzzling at first. And over the years, it kept on giving new meaning to me. It never got old. Paul’s most-quoted passage from his letter to the Corinthians is one of those things in the Bible, like Psalm 23, that just gets better and better, the longer you live. In Anglican circles, it’s pretty much required reading at weddings. I remember when they read it at my sister’s wedding, ten years ago, and how much happiness and depth it added to the occasion. Anyone who has ever had it read out at their own wedding will know- it’s powerful stuff. Which is what inspired me to make a drawing out of it. When we asked people for feedback on the next gapingvoid print, “We Need To Talk” came out the winner. It’s now in production and the pre-orders are now sold out. That being said, there was a lot of backchannel interest with “Corinthians”, as well. It was by no means a distant second. Not to mention, it was a damn fine design and the message is timeless. So what they heck, we decided to make Corinthians available as a limited edition, as well. 2. Once its printed, it’ll retail for $450 [plus shipping & handling]. Like last time, you can pre-order the first 30 in the edition at a discount, i.e. $250 [plus shipping and handling]. To secure your order, please use the PayPal button above and make a $100 deposit. The PayPal form will ask you for all your details [including your preferred shipping address], which of course we’ll have for our records. Why are we asking for a deposit? To weed out the spammers, flakes and trolls out there [This is the Internet, after all], leaving only committed buyers in the mix. No other reason. This shall be our standard practice from now on. 3. The print will be ready to ship in 4-6 weeks. We’ll send you another PayPal for the outstanding invoice once the prints are packed and ready to be shipped. 4. The print will be the same size as the others [i.e. large, approx 21″x32″], hand-signed by me, and it goes without saying, the same high-quality inks and papers will be used. 5. If you have any questions, please feel free to drop me an email at gapingvoidprints@gmail.com, and either Laura or Me will answer them. I’m excited about this one. This Biblical passage has always meant a great deal to me, and as I’ve been delighted to find out via blog comments and emails, it turns out it means a great deal to a lot of other gapingvoid readers, as well. So it’s looking like it’s going to be a great little project. Once Again, thank you for your love and support. Rock on. 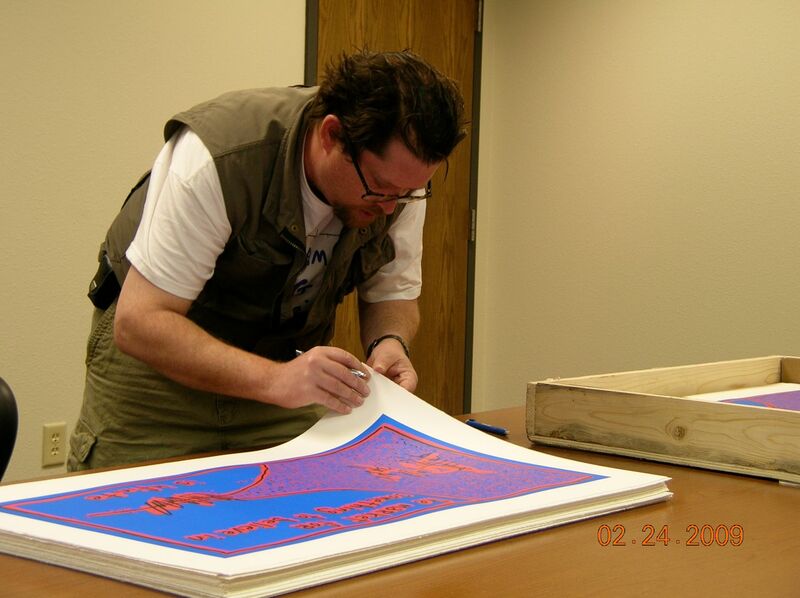 Hugh – I think it’s great that you’re able to leverage this blog and your significant audience to sell your prints. They’re really cool and you’ve put a lot of work into the blog for a long time without making a dime. You’ve been giving your art away for free for years.I totally get that. It just feels like the ratio of original thought posts to sales pitches has been a bit out of balance recently. The large majority of your massive audience comes to your site for a very specif reason – and I’m not so sure it’s to buy art. Maybe this shift is intentional. Who knows, I could be totally off base. Oh wow! No comments so far? I love that scripture too. It has always been my favorite. I was actually surprised to see it here, since most people I’ve talked to in the past did not know of it! 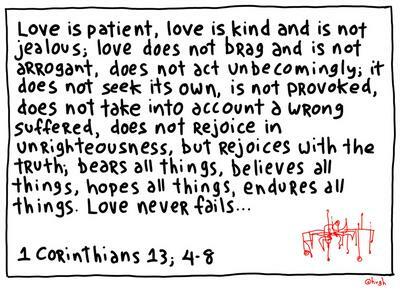 Incidentally, I “think” the scripture means a lot more then love, as in marriage or relationship. Let’s not forget God equates himself with Love (if you read the whole chapter, you will learn about the “mystery”). I could write a lot about it, but will be brief and simply say that God cannot be understood by the mind, but He can be understood through Love. But the tricky part is that this “Love” is a lot more then just a feeling. Being back in Texas is rubbing off methinks! Good call – liking your action sir. Thank you, Hugh. When I look back at my life, the most success I’ve had was in the moments when I thought of Scripture the most. It guides so much of my life, but no one seems to mention it in 2.0. Essentially, if you have something of value, you should show it to people. You shouldn’t hide it. It is selfish. Anyway, I hope this print gives someone hope and inspiration to someone who didn’t have it. …a breath of fresh air. God’s love for us is so cool.